​In this project we learned how our 1st amendment right (freedom of press) causes our society to check itself and empower the people. Everyday we read any news story we wanted, I discovered a site called propublica and realized just how little I knew about what was going on around me. I found that I didn’t know anything about what was happening around me. Our final product was an article we crafted about anything we wanted. Through the knowledge I gained I decided controversy was the answer, in this I chose graffiti. A simple act of painting on a wall is very important to me and the greater graffiti community. I appreciate this project for giving me a voice. From this project I will take away the importance of media in our world. This project taught me all about how to look at things in a more challenging way. Not to take the truth for granted. My favorite take away is looking at media in the umbrella of conglomerates. The majority of media outlets are owned by less than 10 companies. The best news outlet that I have found is propublica because they are independent and focus on issues that are hidden in plain sight. I am going to appreciate a few projects for the rest of my life and this is one of them, it has taught me that it is up to us to be informed about what we are responsible to vote on and change for the rest of us. I changed a lot in terms of being a journalist. The biggest problem I faced was figuring out what to write about graffiti. I don’t know many other graffiti artists and I am still a beginner myself. I didn’t know how to get out further in the community. Eventually I remembered that we have a resident art teacher at school who commends graffiti. Next time I will most certainly look closer to home when looking for information. I am particularly fond of my information that I found relating to graffiti artists without much media, many graffiti artists are covered in mystery and illusion, but some do it legally and with their own names so that they don’t have to hide. I really think this project has helped me gain insight in things I was passionate before this project. “Art should comfort the disturbed and disturb the comfortable,” said Cesar Cruz. This single quote defines graffiti. At the mention of the word, most people think of stolen spray paint and illegality. 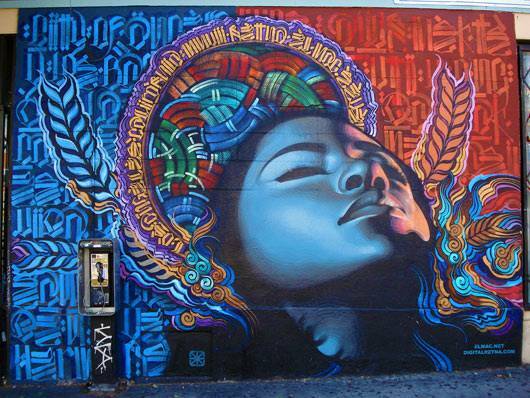 But the culture surrounding graffiti is one of the most beautiful I have ever seen. Pure unadulterated expression (mostly of controversial views) is silenced by the government. According to the website “Criminal Defence Lawyer” “If you are convicted of a graffiti crime in the state of Nevada, the penalty ranges from as little as fine of between $400 and $1,000 and serving 100 hours of community service, to as much as five years in a state prison and a $10,000 fine. ” But at Animas there is spraypaint on site and small stencils and tags everywhere you look. We are encouraged to express our views. I have read the words on the sidewalk saying “Don’t follow leaders” hundreds of times in my short two years at AHS. This is the message this school has given me, as opposed to in public school, where I was taught the opposite. Graffiti has given me the means in which I learned how to show people my views in a arguably beautiful way. I was told to push back on things that I thought were wrong, and to actually look at the issues that affect me everyday. Graffiti can also express appalling things such as racism, objectification, homophobia and even gang crimes. Bayfield Middle School was tagged with heroin needles, drug images and things that in my opinion 11 year olds should not be exposed to. The Bayfield Calvary Church was also tagged with Satanic emblems. I do not personally condone all Christian views, but I am against hate crimes. It is these crude views that are destroying the greater graffiti community, who use it as a legitimate form of expression. I am pushing for our school to donate one wall to a yearly mural that we as a school would create together. Please email s.grunert19@animashighschool.com for more information on how you can get involved.